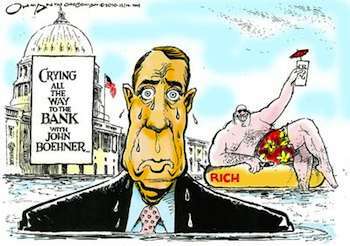 Feb 15, 2011 – Once again on the Sunday news shows, Republican Leader John Boehner declared that "America is broke" — his premise for why we "can’t afford" important investments that are critical to America’s future. In fact, of course, America is far from "broke". It is the largest economy in the world. After collapsing as a result of the recklessness of the big Wall Street banks — and Republican economic policies in late 2008 — the economy has, in fact, grown for six consecutive quarters. The stock market has almost doubled since the crash — regaining most of its value. Corporate profits are soaring. And American corporations are now sitting on close to two trillion dollars in cash. What’s more, we still have the same highly-skilled, productive labor force and the same stock of plants and equipment that we did before the financial meltdown — the same ability to create the goods and services that are the real measures of economic wealth. The problem isn’t that America is "broke." The problem is that economic growth is not being shared with most Americans. The problem is that the very rich are wealthier than ever and everyone else is falling behind. Not only does that mean that the massive store of wealth that we create today is not widely shared. It also means that — taken together — we have less wealth as a nation because so many Americans who could be creating goods and services are unemployed, creating nothing. Of course the implication of the "America is broke" mantra is that we have to make massive cuts in programs and services that benefit the middle class and poor because we "can’t afford them" — us being broke and all. Frankly, you have a hard time taking that kind of talk seriously from a guy who just recently demanded that America continue to give massive tax breaks for the wealthy for the next two years — and who wants to flat out abolish the estate tax that, by definition, benefits only the sons and daughters of multimillionaires and billionaires. Is America broke? Have a look at John Paulson. In 2007, as the financial crisis descended, he made $4 billion in personal income betting against subprime mortgages that helped sink the rest of the economy. Last year he made a record $5 billion in personal income as the manager of a hedge fund. By the way, had he somehow managed to make that astronomical sum of money laying bricks or sweeping floors, he would have paid taxes at a rate of 35% on the bulk of that income. Instead, he paid at a rate of only 15%, since he earned his money by speculating as a hedge fund manager instead of making a useful good or service. Makes sense, right? Last year Mr. Paulson made as much as 100,000 of his fellow citizens who earned $50,000 per year. Paulson’s haul may have been a record, but Appaloosa Management’s founder David Tepper and Bridgewater Associates chief Ray Dalio each did pretty well too — between $2 and $3 billion each. And the rest of Wall Street was back in the money as well. Boehner’s attempt to justify massive cuts in investments that will grow the economy in the future — like education and infrastructure; or his insistence on cutting money that is used by the states to pay firefighters and police; or cuts in programs that take food out of the mouths of poor children — are outrageous so long as most of our economic growth goes into the hands of the wealthy few. * The last time the federal budget was actually in balance was not under the Republicans — but rather under Bill Clinton. The current deficit was caused exclusively by the Bush tax cuts, two unpaid-for wars that cost trillions, and the largest recession in eighty years — caused by the same Republican economic policies Boehner is trying to sell today. Between 2001 and 2008, the Bush Administration and the Republican Congress rolled up more federal debt than all other Administrations in the history of the United States combined. * It is entirely possible to deal with the federal deficit without making the middle class and poor pay the bill. My wife, Congresswoman Jan Schakowsky, who was on the President’s Fiscal Commission, outlined precisely such a proposal last fall. It makes many cuts to spending that go for unnecessary tax expenditures like subsidies to Big Oil and it relies on making the wealthiest among us pay their fair share. It makes the people who had the economic party over the last two decades pay the bill — not middle class and low income Americans who didn’t even get an invitation. * The deficit is not some inevitable consequence of our being "broke" — or some law of nature. It was caused by human decisions to allow wealthy people to reduce their contribution to our common activities and to use them, instead for themselves. * For example, it is entirely possible to raise the same amount that Boehner has proposed cutting in the 2011 (this year’s) federal budget simply by adding a few new tax brackets to the tax code for those who make more than a million dollars. You bump the tax rate up at a million dollars, at ten million, at fifty million — and a billion. You don’t even have to raise them that much. Right now people who make5 billion per year — America’s economic royalty — pay taxes at the same rate as upper middle class professionals who make360,000 — where the current highest tax rate of 35% kicks in. Often, because of tax loopholes — or because they’re hedge fund managers — they actually pay less. The reason why this approach works so well is that all the new income is going to that tiny percentage of the population. To fix the deficit, you have to go where the money is. Yesterday the President proposed his fiscal 2012 budget. It makes major investments in precisely the areas that will help us out-build, out-educate and out-compete the rest of the world in the 21st Century. His budget includes new investments in education, clean energy and infrastructure. Many of these initiatives have already been attacked by Republicans because "we can’t afford them — after all, American is broke." We may not be broke now, but we really will be broke if we don’t invest in the future. The President also proposed cuts in a number of areas that we truly can’t afford (and really never should have done in the first place) — like subsidies to the oil and gas companies that are making record profits. He also proposes $78 billion cuts in military spending over the next five years. But the President was also forced to propose cuts in important programs that benefit average Americans. He proposed cutting the home-heating program, community block grants that are critical to low-income communities, and even the fund to clean up the Great Lakes. These are important programs that are critical to real people and to our future. The President himself supports these programs. He was not forced to propose the cuts in programs like these because America is broke — he made these proposals because the Republicans insisted on continuing the Bush tax cuts for the wealthy for the next two years and that limits investment in important priorities. Think of it. It is outrageous that we should cut money that assures that people don’t freeze in the winter so that the likes of John Paulson — the $5,000,000,000,000 dollar man — will not have to pay a couple of percentage points more on his income taxes. But that is exactly the consequence of Republican insistence that the Bush tax cuts for the rich continue. And it is just the beginning of the menu of Republican "priorities" that we will see laid out over the next several weeks. All of this "America is broke" — "just stop the spending" — rhetoric sounds very appealing until you start looking at who is hurt by the cuts, and who benefits by not paying their fair share to finance government — the things we do together. Over the next few weeks, the budget debate will shift from the rhetorical and abstract to the personal and concrete. If progressives can make that happen, the Republicans will be forced into a full retreat when it comes to the budget debate. It’s about time.